HPE, an IEM partner as a major player in Internet of Things, deploys its universal platform for intelligent parking. The technology of the future, PrestoSense detectors aim at improving city traffic flow through different applications. Installed directly on the ground, the sensors detect the presence of a vehicle and its parking time. This information is transmitted through the telecommunication network of Internet of Things (LoRaWAN). They are then transmitted to the operating systems: Presto1000 for the parking activity analysis, control optimization and sensors maintenance and PrestoPark to inform motorists of available parking places. HPE offers a connected platform for the Internet of Things allowing joining several sensors. It integrates support of PrestoSense detectors and Presto1000 and PrestoPark solutions. This application, suitable for IEM solutions, was presented by HPE at their conference last September in Boston. 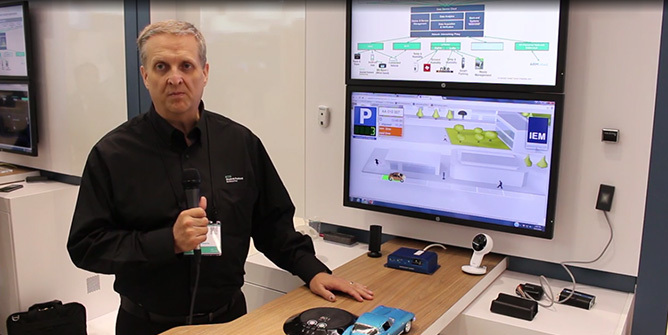 Jeff Edlund, CTO of HPE’s Telcos Group, gave a demonstration (here video).